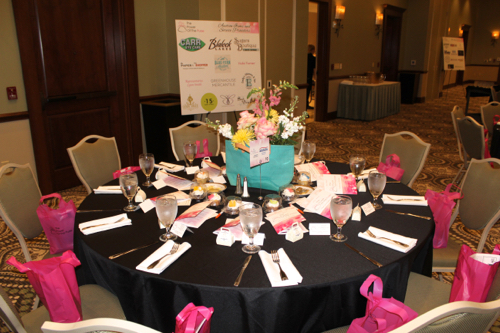 Last year, so many of you seemed to enjoy my photos from our local community foundation's purse-themed fundraiser, the Power of the Purse, that I thought I'd share some photos of the latest event, which was held last Thursday. Our event photographer took the "official" photos during the event itself, so I don't have any of our speaker, Minda Dentler, but she was the first woman handcyclist to complete the Ironman World Championship in Kona, Hawaii. She was absolutely amazing and left us all in tears! Born in India, she developed polio as an infant, and as a result, both her legs were paralyzed. Although she was left in an orphanage, she was later adopted by a US family and came here at age 3, eventually having surgery and learning to walk with the help of crutches. She told of growing up in an athletic family and of her journey to the Ironman competition. I'm pretty sure every woman (and a few men!) in the room left feeling quite motivated! 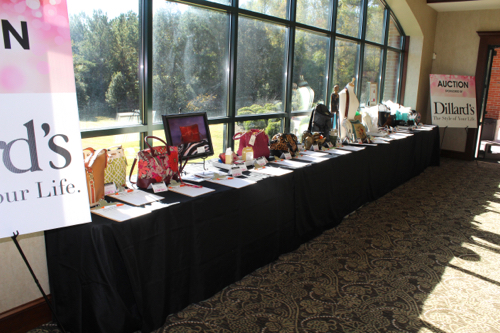 This event benefits the Coweta Community Foundation's Women's and Children's Fund, and since it's called "Power of the Purse," purses are used in the theme and decor. 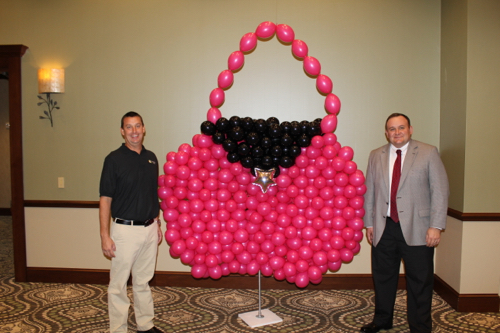 This year, they had a fun oversized purse that lots of folks posed with, including my friends Phil and Monica. 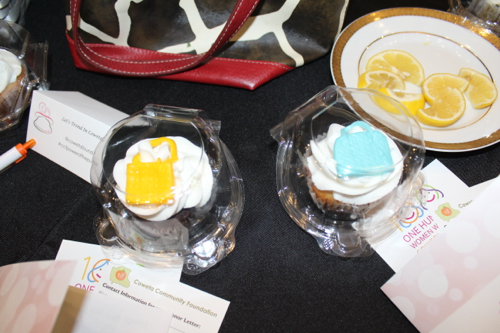 Cupcakes with fondant purses on them! 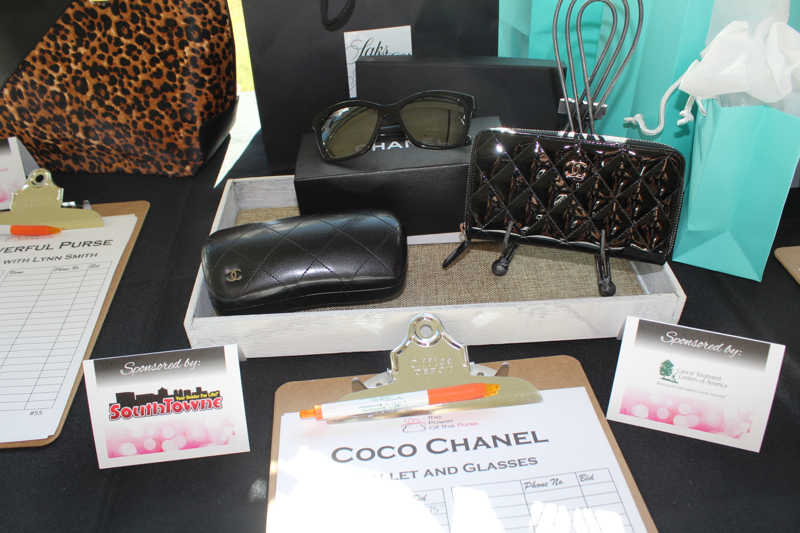 Of course, the *real* purses are always quite the draw, and this isn't even half of the ones that were in this year's amazing Silent Auction. The other fun part of this event is that the Foundation annually names a "Woman of the Year," and this year it was my friend Nancy (turns out I have a lot of friends named Nancy! 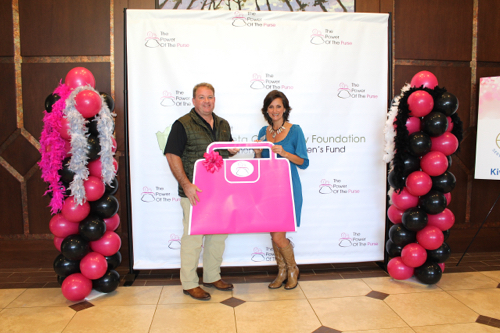 ), who is a tireless advocate in the fight against pancreatic cancer. I was thrilled to see her recognized for her hard work. 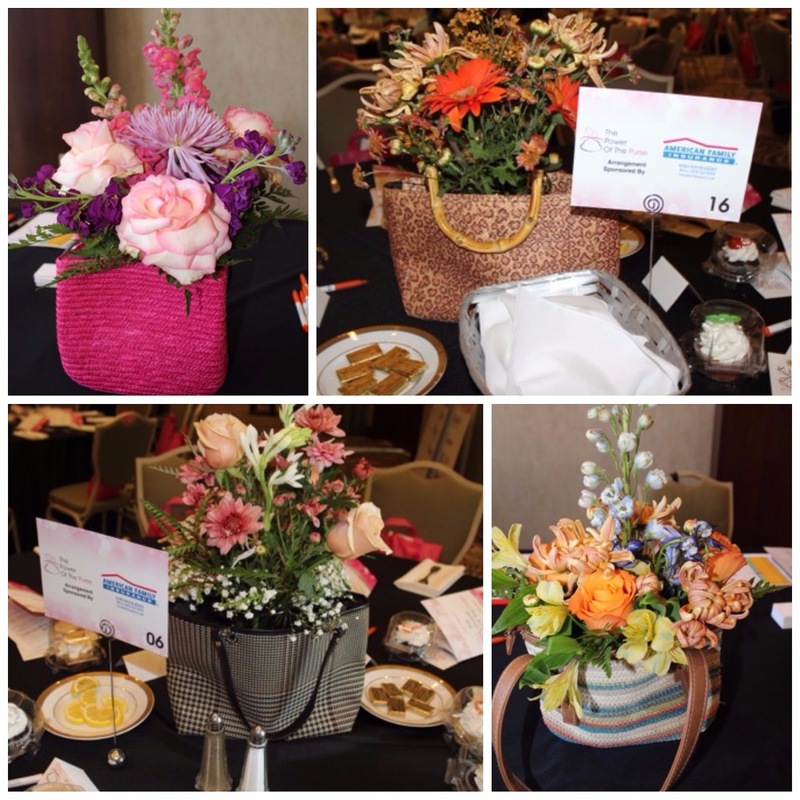 It was another fun event for a great cause, and I was so honored to get to be a part of it. 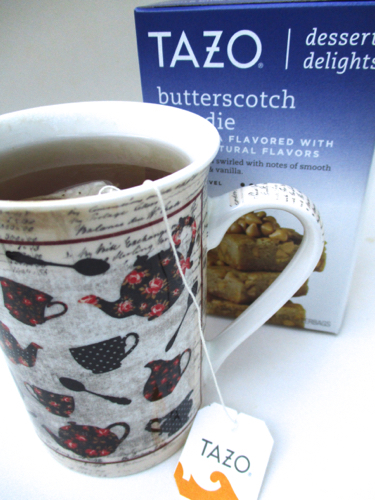 Tazo has a new line of dessert teas out, and I decided to give them a try when I saw them at Kroger this week. 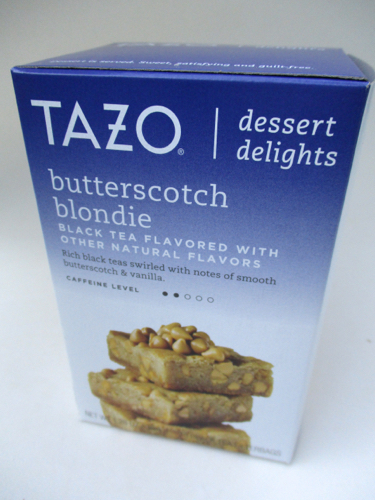 This one is the Butterscotch Blondie flavor, which is a great idea for a tea. The tea has a bit of astringency that I need to figure out how to soften (milk? sweetener? 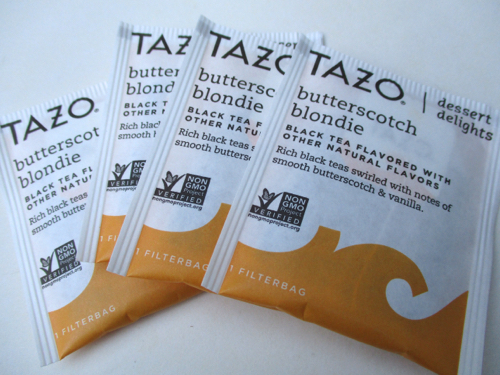 I don't like to add things to my tea), but I did enjoy the pronounced vanilla flavor and agree this is more of a dessert type of tea than other Tazo teas I've tried. Have you tried this new line yet? 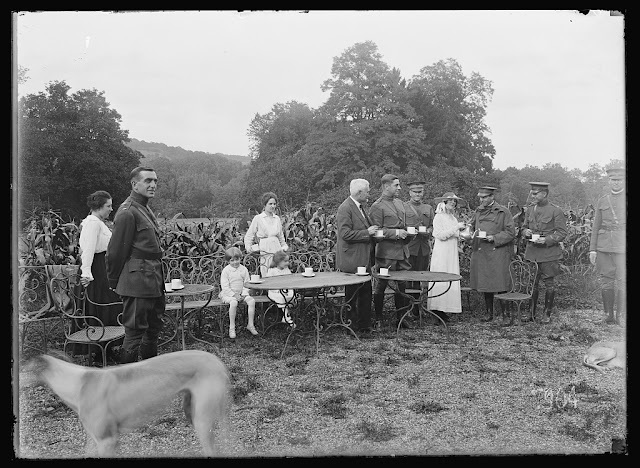 "Mrs. Corey pours tea for a visiting colonel"
The Library of Congress seems to have digitized a heap of new American Red Cross photos, and this one from September of 1918 is so charming! Here's what the site says about the photo: "Mrs. Corey's A.R.C. Officers Convalescent Home No. 8, Chateau de Villequeis, Verrieres de Buisson. (S.E.O.) Afternoon tea on the terrace. Mrs. Corey pours tea for a visiting colonel. The daily Bridge game at Chateau Villegenis. Mrs. Corey and some of the officers. Chateau Villegenie or as it is known now AMERICAN RED CROSS Officers Convalescent Home No. 8, was given to the Red Cross by Mrs. Corey for the duration of the war. It has accommodation for 60 officers and with its beautiful building and spacious grounds makes an ideal convalescent home. It is situated at Verrieres only 18 Km. from Paris." You can find the image online here if you'd like to bookmark it or enlarge it! Announcing the Tea Lovers' Book Club! I love book clubs, and I've been in several over the years, so I don't know why it only recently occurred to me to launch The Tea Lovers' Book Club! Here's how it will work: If you want to join, just read the book. That's it. I plan to announce each month's book at least one month in advance, and I'll let you know the day I plan to post my own thoughts and ask for others to share theirs. 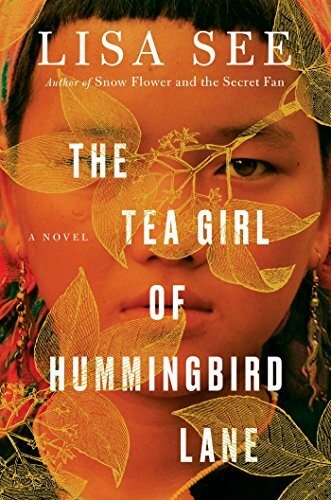 Based upon quite a few excellent recommendations, I've chosen The Tea Girl of Hummingbird Lane by Lisa See for the first Tea Lovers' Book Club selection. Several tea friends have already read the book, so I hope you'll come back the first Monday of December, December 4, and join in the discussion! My hope is that others will be encouraged to read more books on a theme we all know and love. AND ... to make this even more fun, I am planning some special giveaways and prizes *exclusively* for those who participate in the book club. I've already been thinking of how fun it would be to have, say, a bookmark exchange for those who participate in The Tea Lovers' Book Club. So there you go. I want to keep it simple with no official sign-up, not a lot of rules, and just an easy way to be inspired to do a little more reading. And if you want to join in the fun, start reading The Tea Girl of Hummingbird Lane now, and I'll see you back here to discuss it on December 4. Got suggestions for other tea-themed books the club should read? Ideas for more ways we could have fun with a book club? Just let me know! Sometimes, the best time to find tea-related cards is when I'm not looking for them! I was at Walmart and looking for a birthday card when I spotted these two. 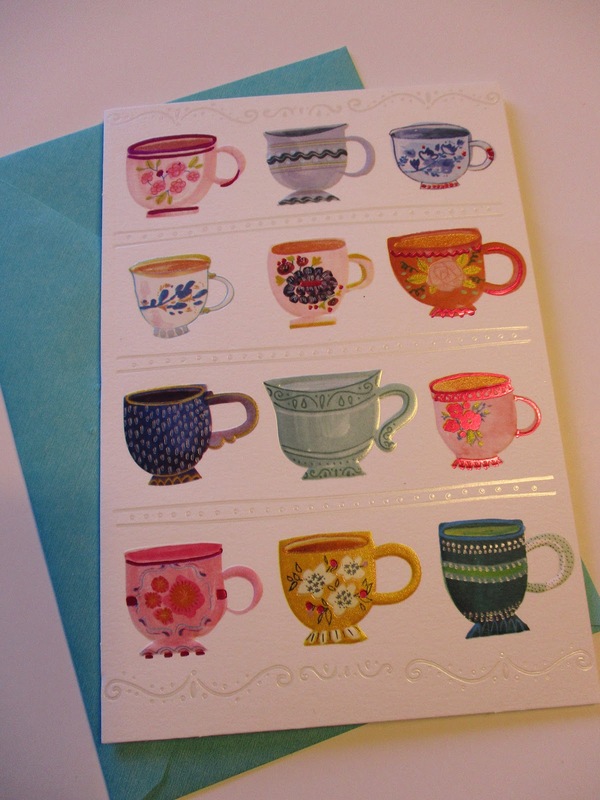 I love this card with all the pretty teacups on the front, and I especially like that it's a blank card, so it can be used as a thinking-of-you card, a thank-you card or whatever I need. 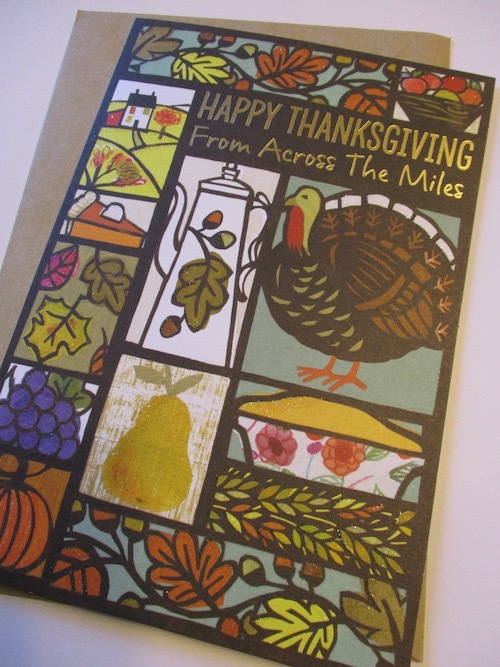 And I saw this one with a kettle on it and remembered that I could use a Thanksgiving card for a friend. This kettle is probably the size of a coffee kettle, but we'll say it's for tea! 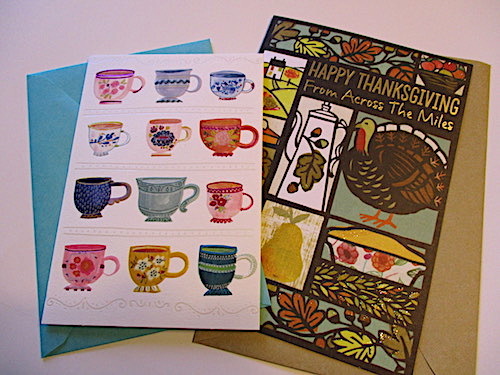 Have you spotted any tea-related cards lately? Miriam went to the oven and took out the pan of crusty croissants, sliding them into a basket lined with a blue-checkered linen napkin. "Do you like iced tea? I don't remember you as a tea drinker." "I am since I learned there are no calories in tea," Bess said with a chuckle. I was browsing in a Goodwill store recently when I came across this Guideposts book, part of their Chesapeake Antiques Mysteries. 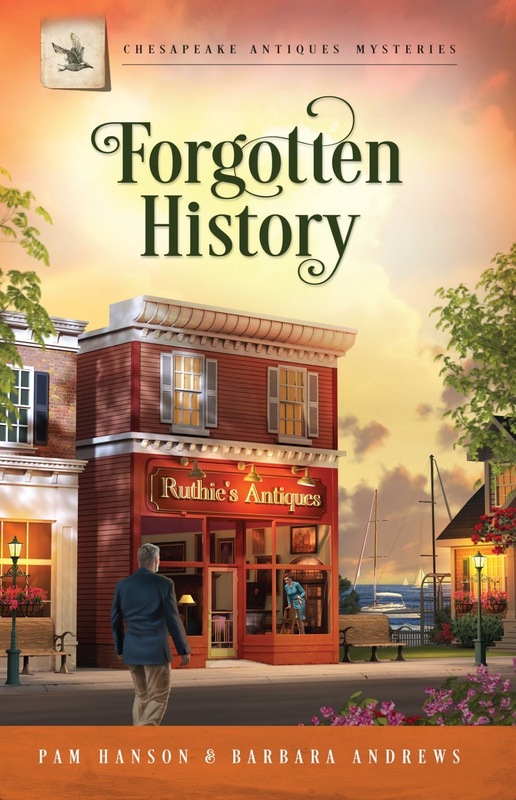 It's the story of Miriam Maxwell, who inherits an antiques business from her late sister Ruth. 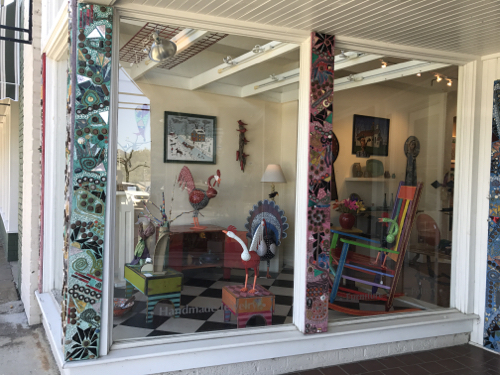 Miriam returns to her old hometown on the Chesapeake Bay in Maryland to decide what to do with the store, and there she reconnects with quite a few people from her past. There's Bess Watkins, an old high school friend, and also Samuel Bentley, whom Miriam dated many years ago. Although no one wants to lose a sister (at least I hope you don't! ), I think many of us might not actually mind inheriting an antiques business. Miriam, however, is no antiques expert and finds herself overwhelmed at all the furniture and antiques her sister managed to pack into her cluttered building. One of her earliest customers happens to be her old flame, Samuel, who buys an antique desk that once belonged to Miriam's family. When he gets home with it, he finds an old letter from Miriam's ancestor in a hidden compartment inside, and that kicks off an intriguing subplot that is woven throughout the book. 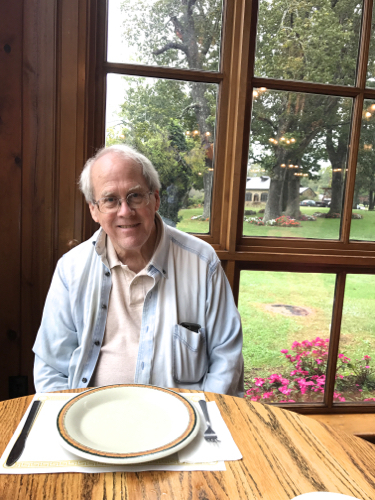 I enjoyed meeting Ruth and her friends, and it was fun to learn about antiques through the eyes of someone new to the collecting scene. In fact, I found myself reaching for my iPhone so I could look up things like Westmoreland glass, which I'd never heard of before. The only negative about this series is that there appears to be only one more title, according to the Guideposts website, but I have it and am ready to see what's in store for Miriam next! A most delicious new holiday tea from Palais Des Thés! 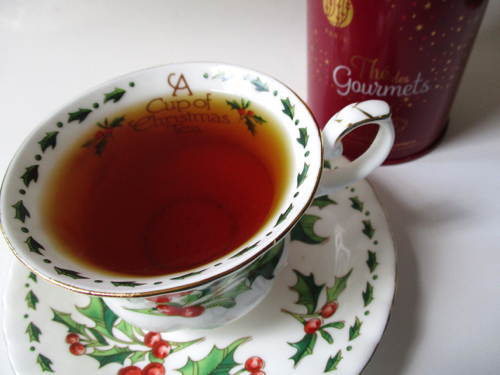 Palais Des Thés in Paris wrote to see if I'd like to sample one of their new holiday blends, and since I have long enjoyed their teas, I naturally said yes. 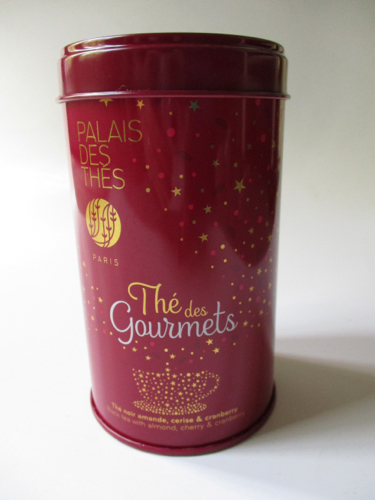 I was expecting perhaps a small envelope of this Thé des Gourmets, so I was quite surprised when a box arrived at my doorstep containing this beautiful ruby-red tin of tea. And don't you love that starry teacup? Lovely! 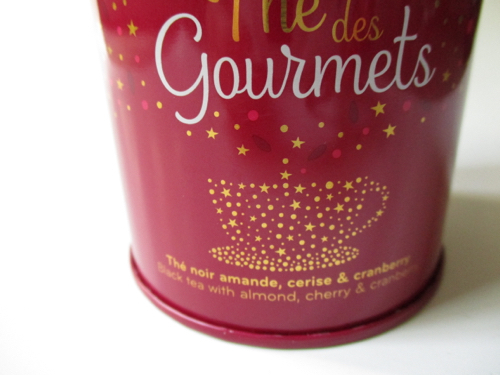 But look at the flavors in this black tea: almond, cherry, and cranberry—my favorite holiday flavors! The minute I opened the tin, I was in tea heaven. 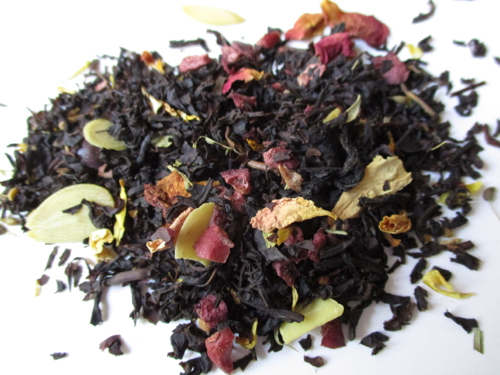 This tea has a delightfully fruity scent and a taste that definitely seems like dessert in a teacup! The almond, cherry, and cranberry notes are there in equal measure, and it's a tea so sweet and rich that it definitely needs no sweetener. Normally I'd wait until the holidays to tell you about the tea I'll be drinking over Christmas, but since this is a limited edition, I thought I'd better go ahead and mention it now so it will be on everyone's tea radar. I'm going through this tea like crazy and wanted to order another tin, but it's not available yet. The minute it is, I'll be sure to mention it here, because I definitely have a new holiday favorite—and I'm pretty sure some of you will as well! This week I went over to a friend's new house to see it decorated for the first time. I'd been through when it was finishing construction and had a good idea of the layout and color scheme, but I was so amazed at how different the place looked fully decorated. One of the many things I loved about her new home is the wall of old botanical prints she has. I left there thinking, "Hmm ..." and when I found this "cha" drawing on the Library of Congress website, it set me thinking that it might be fine to have a wall of botanical tea prints! 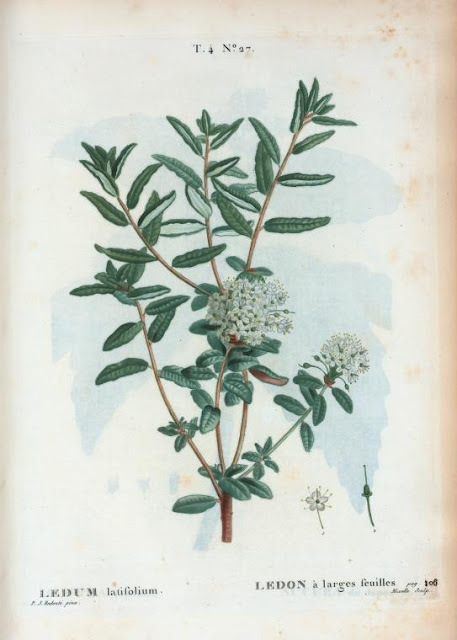 And here's one for "Labrador tea" from the New York Public Library's digital collection. This herb has traditionally been used to make a tea drunk by the Eskimos and Indians of eastern Canada. 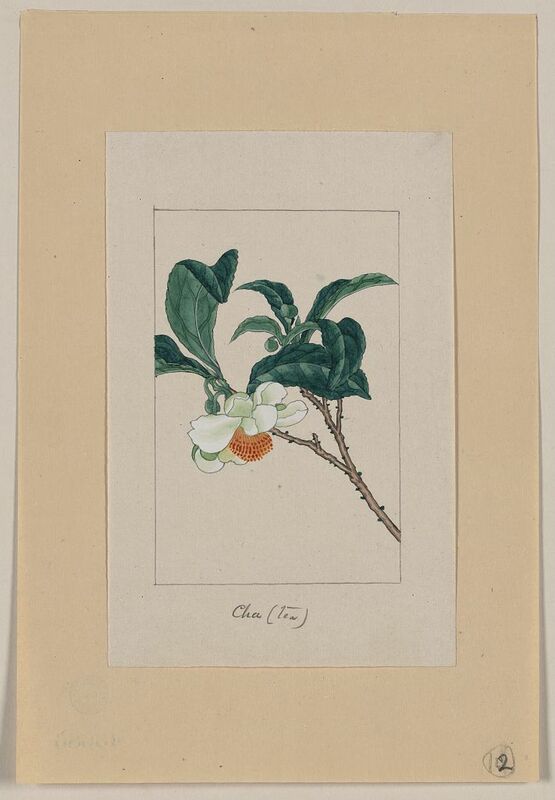 And Wikimedia Commons has this lovely image of the camellia sinensis plant, which is now in the public domain here in the US. A wall of these would certainly be pretty, don't you think! 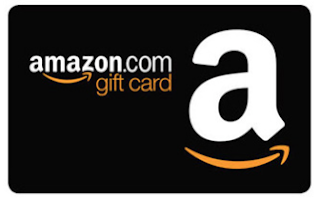 Well, I haven't found any cute fall teawares for the October giveaway, so I'm going with an old reliable giveaway item: an Amazon e-gift card for $15! Here's how you can win: 1) Tell me the name of the last book you read and enjoyed (I'd rather hear about good books than bad ones!) 2) Be sure to include a way for me to get in touch with you if you're the winner. 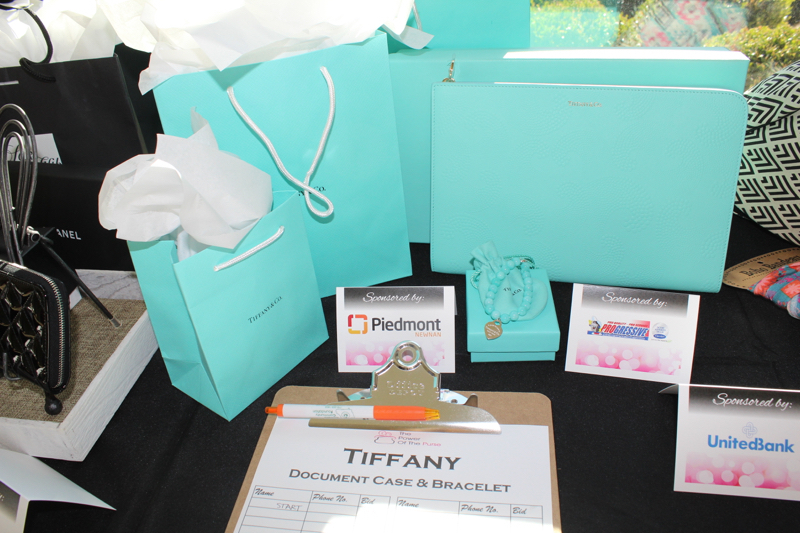 You may enter the giveaway through 7 a.m. Monday, October 16. Good luck! 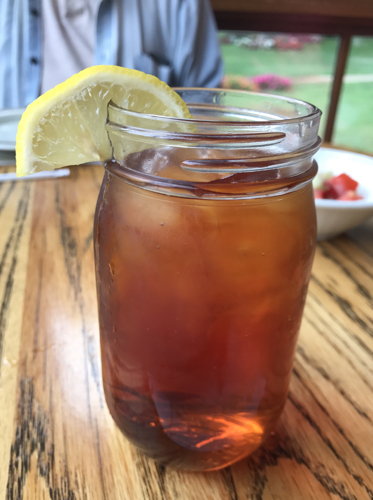 Few things say "Southern hospitality" more than a Mason jar full of tea, and that's exactly what you'll see when you dine at the Dillard House in Dillard, Georgia, one of our favorite spots in the North Georgia Mountains. Alex and I just had the pleasure of spending another lovely few days up there, with plenty of time for reading, strolling, eating, and shopping! 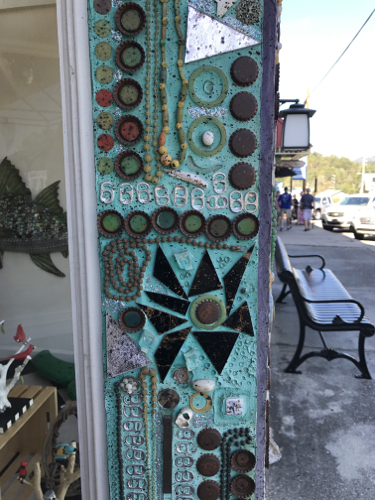 On our last trip, we discovered the charms of nearby Clayton, Georgia, the hometown of a dear friend of mine. This time there were several new shops in town, including this funky art gallery I absolutely adored. 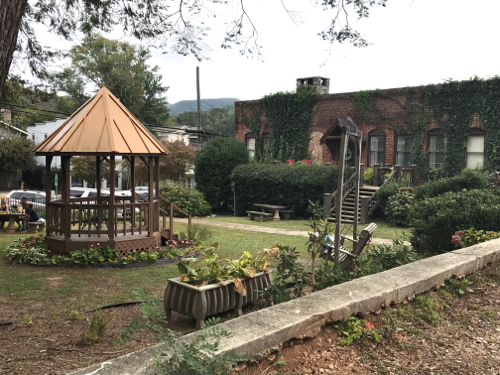 Clayton also seems to have lots of hidden gardens tucked away behind some of its streets, like this one where I saw some folks relaxing as I shopped on Saturday. The town clearly takes pride in its flowers and gardens. And does anyone know what this flower is? It's not the best photo since I took it with an iPhone and not the close-up lens on my camera, but it was so pretty, I had to try to get a shot. 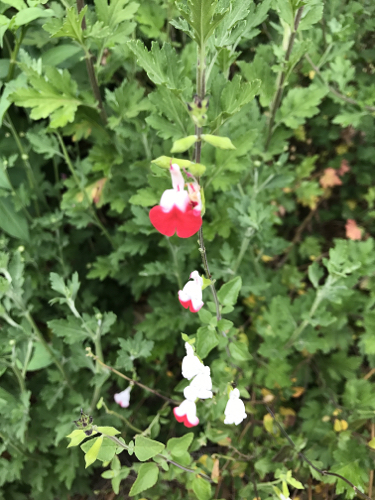 It reminds me of a bleeding heart, but bleeding hearts are all one color, aren't they? 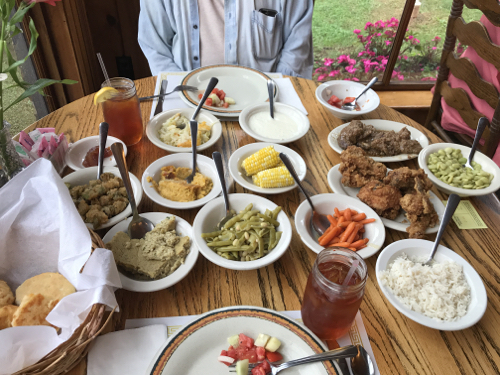 And here you see our lunch table quite literally filled with bowls and platters of food! We ate plenty (I had skipped breakfast to make sure I was good and hungry), and we still had four large take-out containers full to take home, so I don't anticipate having to cook until later this week. 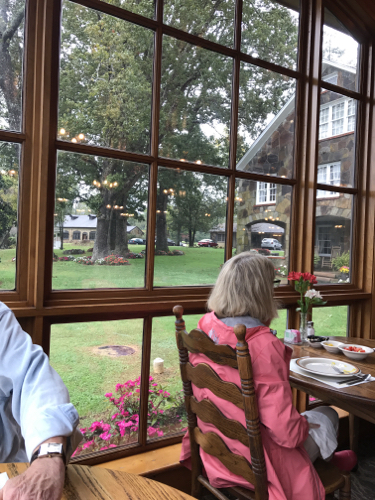 Hurricane Nate was moving in so I didn't get to take my usual photos of the dahlias in the garden out front, but I enjoyed the great view of the property from my table. 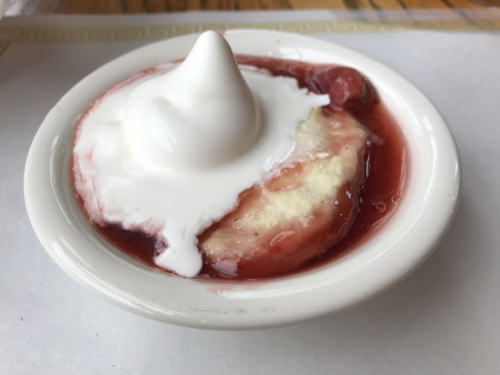 Oh, and one thing you do not want to save for later is their delicious hot strawberry cobbler with vanilla ice cream! It's a dreamy good dessert and well worth the splurge once a year! I believe I shopped about eight antique malls while I was in town, yet I didn't see one teacup or tea mug that I just had to have, and I had recently read of a collector who said she no longer buys things she likes but buys only things she loves. I think that's a great rule at this stage of my over-collected life, and I surprised myself by buying only a new cross necklace on this trip. 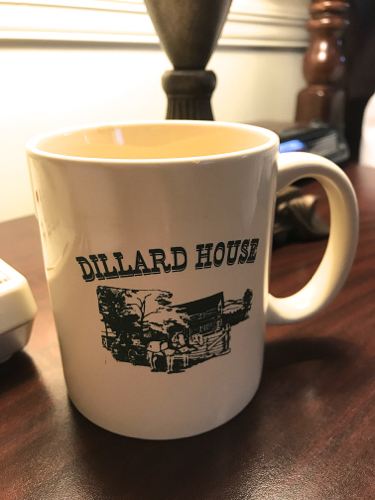 So while I didn't pick up any new teawares as I had expected, the Dillard House has mugs in the room, so this served quite well as my "tea mug" for this trip. It was another great time in Dillard with my sweetheart, and I hope we get to enjoy many more trips there! One challenge I find when I visit the Library of Congress website is that there's often very little information to accompany the photos. 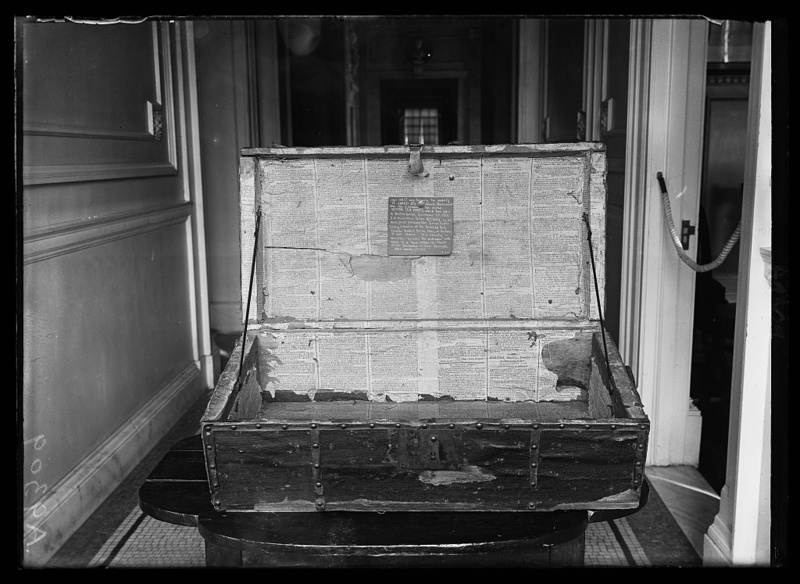 This week, for instance, I found this image, titled "Chest of Jared Joy, member of the original Boston tea party." I tried to enlarge it so I could read the words on the piece of paper attached to the lid, but that didn't work. So here's my question: do you think this was just an everyday chest that belonged to Mr. Joy, or do you think the chest had some significance to the Boston Tea Party? This couldn't possibly be the kind of thing that the tea was stored in, could it? I'd love to hear your thoughts! And while I try not to covet, I must say that I would dearly love to own this item in the collection of the Massachusetts Historical Society, some original tea leaves "steeped in Boston Harbor." Can you even imagine how delightful it must be to have an artifact that was actually there? Wow! 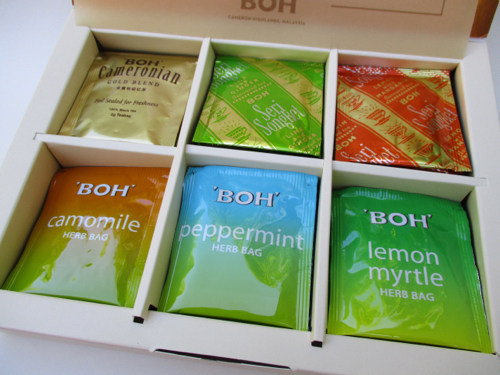 Recently I learned of a new name in teas, BOH Teas from Malaysia. They sent me this lovely gift set to sample, and I was immediately impressed by the classy looking packaging! 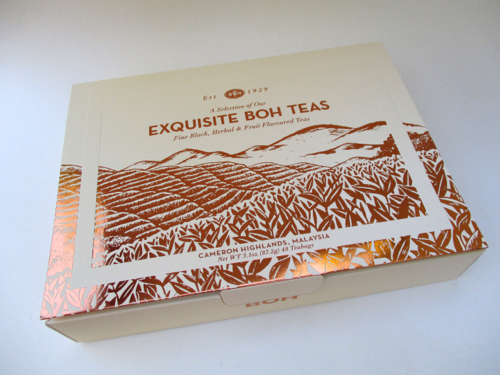 Inside the package is an insert describing the six varieties of tea bags inside. This week, I sampled the first row of teas, which included, top from left, the BOH Cameronian Gold Blend, Seri Songket Lime Ginger, and Seri Songket Lemon Mandarin. It would be hard to name a favorite of the three because they were all excellent! 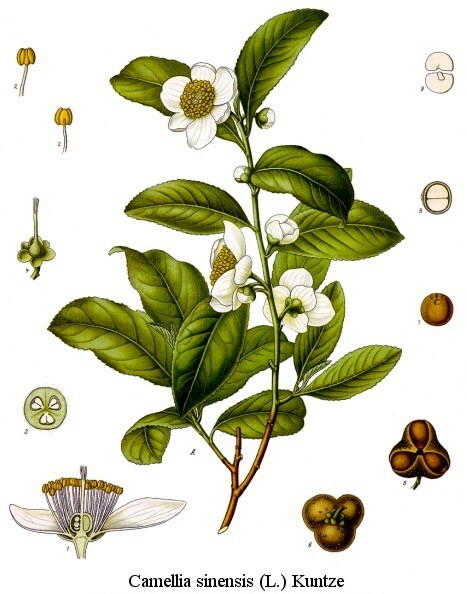 The BOH Cameronian Gold Blend had a rich, fresh taste, with that almost woodsy quality I have rarely found in a tea bag. And Lime Ginger teas are usually a disappointment because the lime is usually overshadowed by the ginger, but not with this tea! I got a great lime taste with a little zip from the ginger. The Lemon Mandarin tea was a delightfully citrusy treat, tasty as well as soothing for a throat that's been feeling the ravages of fall allergy season. 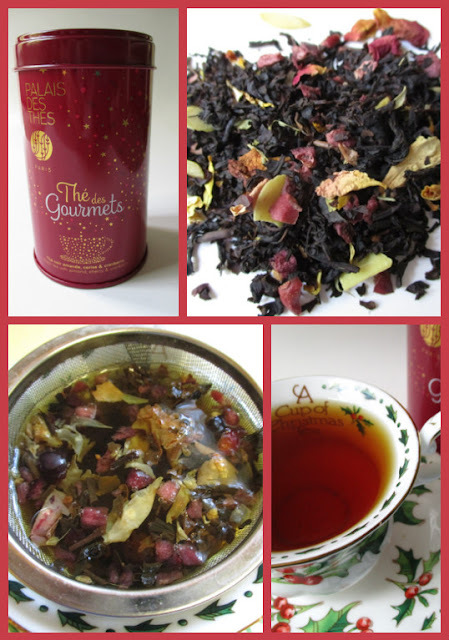 You can find out more about these teas here, and now through December 31, 2017, you can use the code TFRIENDS (how cool!) to get 10 percent off your order of these and other BOH products on Amazon.com. I think this gift set is quite attractively priced already, and with 10 percent off, it's even more appealing! 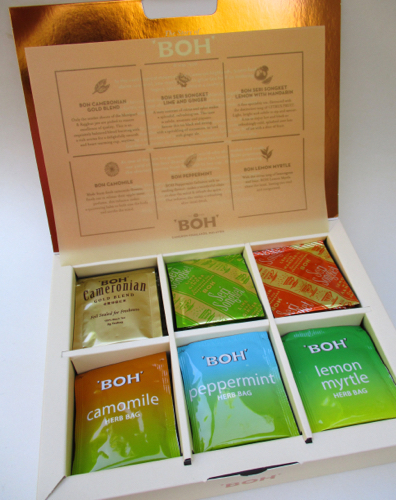 So thank you to BOH Tea for the samples and for the nice discount for all my tea friends! 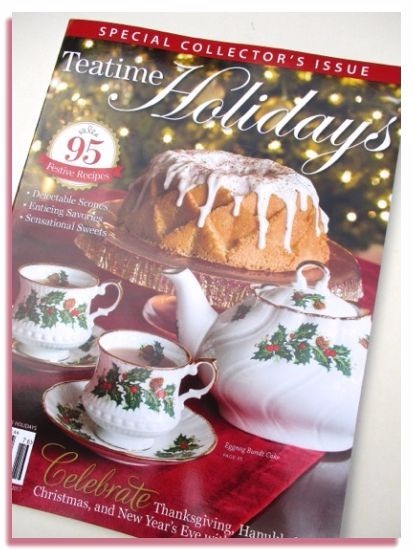 I was happy to see over the weekend that lots of holiday magazines have hit the rack at Ingles, and naturally, the one that caught my eye was the new Teatime Holidays, offering afternoon tea recipes for Thanksgiving, Hanukkah, Christmas, and New Year's Eve. 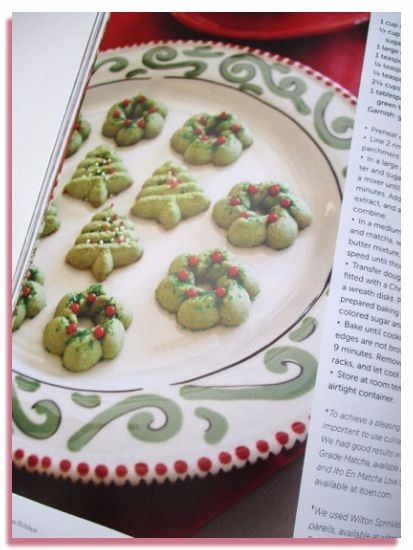 Since I learned to use a cookie press a few years ago, these pretty embellished pressed cookies caught my eye, but when I realized they were made with matcha tea, that made me want to make them even more! And though I've always liked red velvet cake, I don't believe I've seen one adorned with crushed peppermints, which strikes me as a very, very good idea. 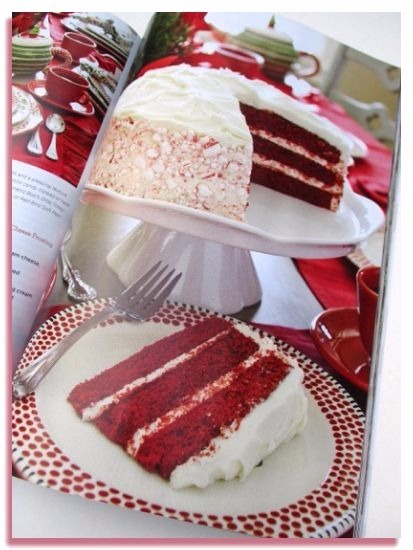 I've also got a peppermint pie recipe from an old tearoom cookbook that I want to try this year, but this cake looks pretty yummy as well. If you've picked up a few of these Teatime Holidays magazines over the years, you know exactly what to expect in the way of offerings, but I did want to mention one new savory idea that caught my eye. 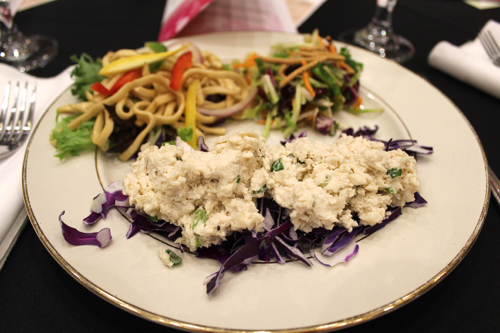 In at least two recipes, they've used those pre-packaged phyllo cups to serve salad-like treats including broccoli-kale slaw and crab salad. What do you think about that idea? I kind of like it. At any rate, if you're a collector of Christmas magazines as I am, here's one to look for now because it will be gone by the time you need it in December!